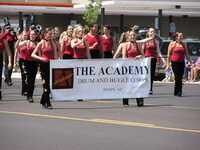 In 2001, the founders of The Academy came together with the vision of enhancing the culture of music, dance, and the performing arts in Arizona. Set up as a non-profit organization from the beginning, this group formed as the first Board of Directors and began programming events, ensembles, and fundraising campaigns. Their first goals were to start small with a few programs and events, and, to increase awareness of the positive effect that an organization such as this can have on a community. Since that time, the organization has raised money to acquire instruments and equipment to support all of its current programs. In addition, relationships continue to grow with the leaders in surrounding communities that support our efforts. While acquiring a facility of our own is one of the visions of the future, the programs have been run out of community facilities as they are available, allowing for a modest and continued growth.